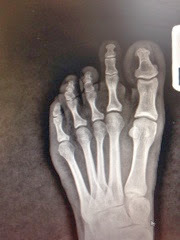 Dr. Pelto's Blog: Why is my second toe larger than my great toe? Why is my second toe larger than my great toe? Many patients come in with a second toe that is larger than the big toe, especially females, and they think this looks kind of odd and are not sure what to do about it. Usually it’s because one toe is a little bit longer or the metatarsal bone is a little bit longer as you can see in this x-ray. What to do about it? Just leave it. If it doesn't bother you, don’t do anything. One of the problems that can happen is that if you shorten a long second toe, by taking out some of the bone it can compress some of the blood vessels and cause a sausage toe that isn't very easy to deal with. My opinion now for dealing with second toes that are too long is just to leave it that way.